Fourteen stakes races during its 16-day run, as well as a 5% blended increase in its overnight purses, highlight Del Mar’s Fall Racing Festival beginning on Friday, November 9. Nine of the 14 stakes are graded, led by the Grade 1 pair of the Hollywood Derby and the Matriarch Stakes, both of which will carry $300,000 purses and help to ensure an exciting finish on closing weekend on December 1 and 2. “California racing is trending in a positive direction and our Fall Festival will be part of that,” said Del Mar’s executive vice president of racing Tom Robbins. “Santa Anita and Del Mar have enjoyed very strong meets this year and both were recently named host sites for the Breeders’ Cup in 2019 and 2021. Del Mar’s Fall Racing Festival showcases world-class turf racing with nine of its 14 stakes run on grass – seven of them graded events. The stakes schedule offers a robust holiday program around Thanksgiving weekend featuring six graded events between Thursday and Sunday, five of them on the lawn. 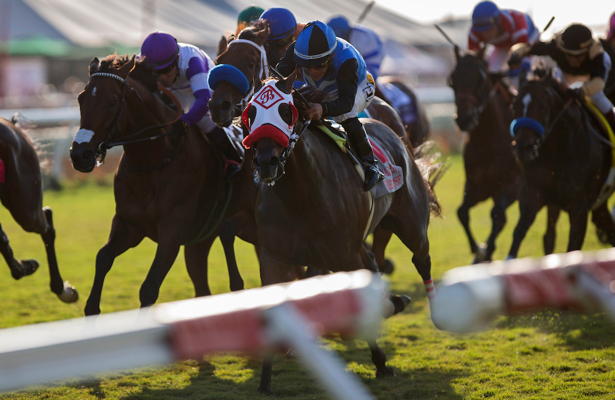 Foremost among the holiday offerings are the Grade 2, $200,000 Hollywood Turf Cup on Friday, November 23 and the Grade 2, $200,000 Seabiscuit Handicap on Saturday, November 24. There will be a trio of stakes for juveniles including the $100,000 Desi Arnaz for fillies on a special Veterans Day Monday, November 12, racing card. Also on the 2-year-old stakes agenda are a pair of Grade 3 grass miles, the $100,000 Jimmy Durante for fillies on November 24 and the $100,000 Cecil B. DeMille on Sunday, November 25. The November 22 Thanksgiving Day festivities, featuring the Grade 3, $100,000 Red Carpet Stakes, will have an early 11 a.m. first post with its final race going off at approximately 2:30 p.m.